Those who track the IaaS cloud market closely know that serverless computing platforms have become one of the hottest new technologies. This week, not to be left behind, IBM introduced its contribution to this market. OpenWhisk is an open source project that enables event driven computing, also referred as serverless computing. 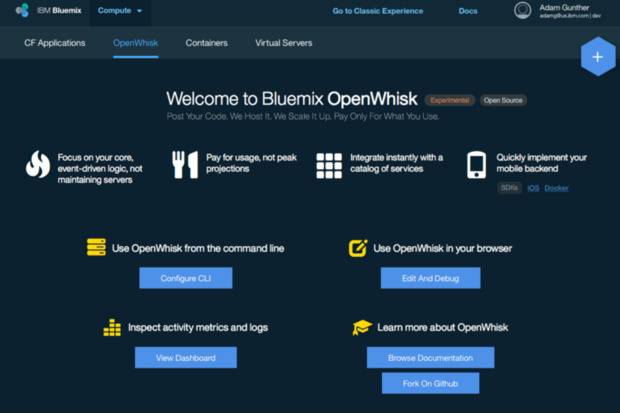 The IBM Bluemix OpenWhisk platform enables developers to quickly build microservices that execute software code in response to events such as the clicking of a mouse or the receiving of sensor data from a surveillance cam. When an event occurs, the code is automatically executed. As a result, developers need not worry about things like pre-provisioning infrastructure, such as servers or operations – they can simply focus on code, dramatically speeding up the process. Amazon Web Services was the first major cloud provider to offer an event-driven computing platform with its launch of Lambda in 2014. The service is entirely cloud-based in AWS; customers upload code to Lambda and the service automatically executes functions based on triggers. Users pay for Lambda based on how many “events” it processes. It costs $0.20 per 1 million requests. Earlier this month Google announced Cloud Functions, it’s Alpha version of this technology on its Cloud Platform. Startup Iron.IO recently launched a version of its software, which enables event-driven computing on the Microsoft Azure cloud. IBM says OpenWhisk will be different from those offerings though. Why? Because it’s open source. “The market currently only has proprietary options,” explains IBM VP of Cloud Platform Services Damion Heredia. OpenWhisk includes features such as “chaining,” which allows developers to build a series of microservices and later connect them together and have them be triggered by events. The system is based on Docker containers. The bottom line is that this serverless computing technology is ushering in a new way for developers to build applications, particularly apps serving the Internet of Things market. Expect the market for event-driven computing to become more popular as these cloud technologies continue to evolve.